Architectures can be defined as structured collections of shared assets and mechanisms whose purpose is to support the sustainable activity of functional entities: houses for dwelling, factories for manufacturing processes, office buildings for administrative ones, human beings for living, etc. Enterprises combine at least two of those blueprints as they have to support operational and administrative processes while keeping their corporate self alive and kicking. Their architectures must therefore secure the continuity of their corporate identities and the consistency of their business processes within their regulatory and business environments.Whatever the supporting technologies, from clay tablets to holograms, that could not be achieved without information systems whose capabilities are to be assessed. Those capabilities should meet enterprise objectives across all architecture layers. The enterprise (aka business) level deals with objectives, assets and organization associated with the continuity of corporate identity and business capabilities within a regulatory and market environment. The systems (aka application) level deals with the continuity and consistency of the functionalities supporting business processes. The platforms (aka technical) level deals with the feasibility, efficiency and economics of systems implementations. Business processes deal with interactions between enterprises and their environment. They are supported by systems functionalities and executed on the associated technical platforms. Engineering processes deal with the development of supporting systems, through business requirements, functional specifications, and software development. Operational processes deal with the deployment and service of supporting systems, from business locations to systems management. The aims of governance will be set on two perspectives: on one hand, monitoring, assessing, and improving processes with regard to supporting architectures; on the other hand planning for architectural changes at enterprise, systems, and platforms levels, and managing the business, engineering, and exploitation processes that will realize those changes. With regard to governance EA would provide for timely, relevant, and accurate data collection and its processing into information that could be pulled by decision makers or pushed to processes according to contexts (business, organization, platforms) and governance level (assets, user’s value, operations). Architectures and processes being orthogonal descriptions respectively for enterprise assets and activities, meeting those objectives will depend on the conceptual hinges connecting processes and architecture capabilities. At business level, i.e disregarding supporting systems and platforms, processes can be defined in terms of symbolic objects, business logic, and the roles of agents, devices, and systems. At systems level, i.e disregarding the technologies, processes should be defined in terms of business functions and operational constraints. At platform level, i.e disregarding the symbolic contents of interactions between systems and contexts, processes are characterized by the nature of interfaces (human, devices, or other systems), locations (centralized or distributed), and synchronization constraints. As it happens, service oriented architectures typify the functional perspective by factoring out the symbolic contents of system functionalities, establishing a symbolic bridge between enterprise activities and architectures. Introducing services in terms of customers, messages, contract, policy, and endpoints could therefore be used to map business processes to architectures capabilities. With regard to corporate environment, documentation requirements are set by legal constraints, directly (regulations and contracts) or indirectly (customary framework for transactions, traceability and audit). With regard to organization, documents have to meet two different objectives. As a medium of exchange they are meant to support the collaboration between organizational units, both at business level (processes) and across architecture levels. As an instrument of governance they are used to assess architecture capabilities and processes performances. Documents supporting those objectives are best kept separate if negative side effects are to be avoided. With regard to systems functionalities, documents can be introduced for procurement (governance), development (exchange), and change (storage). Within systems, the objective is to support operational deployment and maintenance of software components. 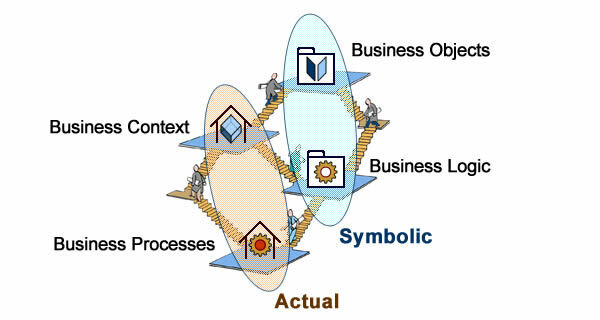 Models of business contexts and processes describe actual or planned objects, assets, and activities. 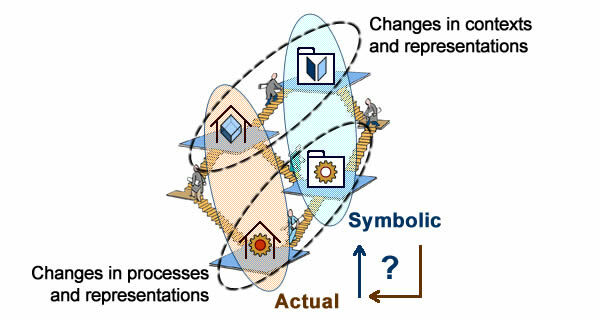 Models of symbolic artifacts describe the associated system representations used to store, process, or exchange information. That could be achieved with MBE/MDA approaches. Computation Independent Models (CIMs) describe business objects and activities independently of supporting systems. Platform Independent Models (PIMs) describe systems functionalities independently of platforms technologies. 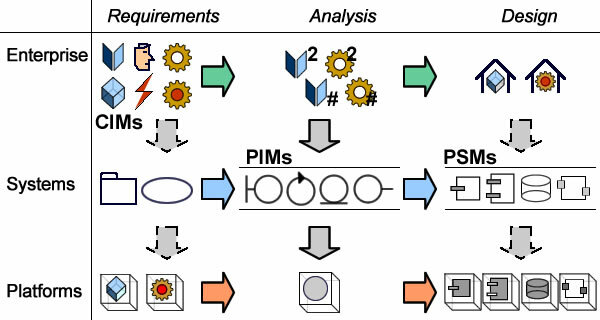 Platform Specific Models (PSMs) describe systems components as implemented by specific technologies. Requirements: at enterprise level requirements deal with organization and business processes (CIMs). The relevant part of those requirements will be translated into system functionalities which in turn will be translated into platforms technical requirements. Analysis: at enterprise level analysis deals with symbolic representations of enterprise environment, objectives, and activities (PIMs). Contrary to requirements, which are meant to convey changes and bear adaptation (dashed lines), the aim of analysis at enterprise level is to consolidate symbolic representations and guarantee their consistency and continuity. As a corollary, analysis at system level must be aligned with its enterprise counterpart before functional (continuous lines) requirements are taken into account. Design: at enterprise level it deals with operational concerns and resources deployment. Part of it is to be supported by systems as designed (PSMs) and implemented as platforms. Yet, as figured by dashed arrows, operational solutions designed at enterprise level bear upon the design of systems architectures and the configuration of their implementation as platforms. With architecture reinstated as the primary factor, MDA can become a pivotal component of enterprise architecture as it provides a clear understanding of architecture divides an dependencies on one hand, and their relationship with engineering processes on the other hand. Enterprise architectures are seldom the direct outcome of planned designs but more often emerge from a mix of cultural sediments, economic factors, technology constraints, and planned designs. Hence the importance of understanding the factors governing changes across architectures. As far as enterprise architecture is concerned, the best option is to chart changes across the documentation of actual contexts, organization and processes on one hand, the description of their symbolic counterpart as systems objects on the other hand. On that basis the first question would be to pinpoint the origin of changes: actual (governed by legacy artifacts and organizations) or symbolic (governed by plans and models). At system level models are used to describe software components. Given that systems are meant to represent business contexts and support business processes, changes must therefore ensure the continuity of systems functionalities. 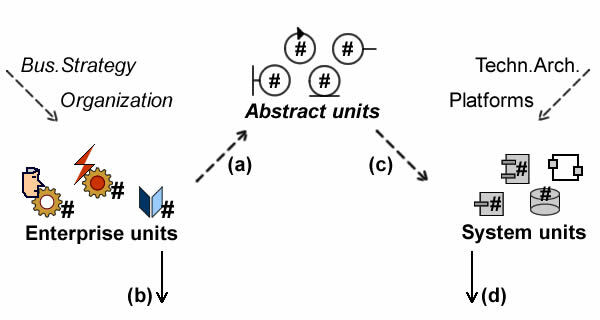 Assuming that functional, persistency, and execution units must be uniquely and consistently identified at both enterprise and systems level, their respective models have to share some common abstract units. Definitions of those abstract units will provide the backbone of enterprise architecture (a). That backbone can then be independently fleshed out with features providing identified structures of objects and activities are not affected (b). From the systems standpoint the objective is the alignment of system and enterprise units on one hand, the effectiveness of technical architecture on the other hand. For that purpose abstract architecture units (reflecting enterprise units) are mapped to system units (c), whose design will be carried on independently (d). Assuming that enterprise architecture entails some kind of documentation, changes in actual contexts will induce new representations of objects and processes. At this point, the corresponding changes in models directly reflect actual changes, but the reverse isn’t true. For that to happen, i.e for business objects and processes to be drawn from models, the bonds between actual and symbolic descriptions have to be loosened, giving some latitude for the latter to be modified independently of their actual counterpart. Specialization will do that for local features, but for changes to architecture units being carried on from models, abstractions are a prerequisite. Whatever the creed, the alignment of systems architectures and capabilities with enterprise organization and business models is often seen as an intrinsic component of enterprise architecture. 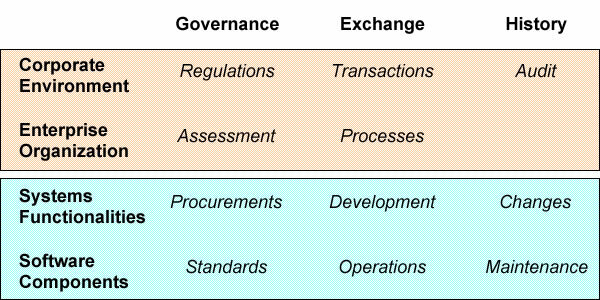 Yet, as noted above, changes on the two sides of the divide are governed by different factors: while adaptation to actual business environments is the rules of the game, systems architectures must both provide for the new opportunities and ensure the continuity and consistency of existing business assets. Adding the different time-frames in the picture, chances are for alignment to remain a fleeting (if not random) contingency. Contexts descriptions (UML, DSL, BPM, etc) are not meant to distinguish between architectural constructs and specific ones. 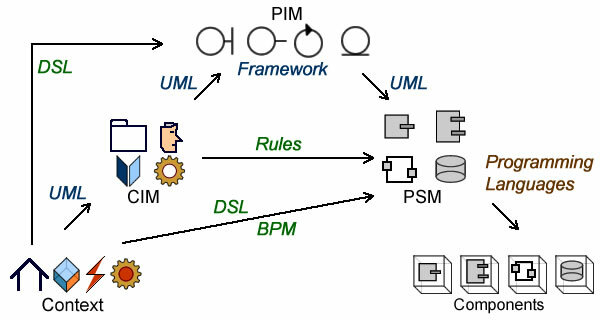 Computation independent models (CIMs) describe business objects and processes combining core architectural constructs (using a generic language like UML), with specific business ones. The former can be mapped to functional architecture, the latter (e.g rules) directly transformed into design artifacts. Platform independent models (PIMs) describe functional architectures using core constructs and framework stereotypes, possibly enriched with specific artifacts managed separately. Platform specific models (PSMs) can be obtained through transformation from PIMs, generated using specific languages, or re-factored from legacy code. At users level the objective is to ensure that applications are consistent with business logic and provide the expected quality of service. That is what requirements traceability is meant to achieve. At system level the objective is to ensure that business functions and features can be directly mapped to systems functionalities. That is what services oriented architectures (SOA) are meant to achieve. At enterprise level the objective is to ensure that the enterprise capabilities are congruent with its business objectives, i.e that they support its business processes through an effective use of assets. That is what maturity and capability models are meant to achieve. That makes alignment a concrete endeavor whatever the level of abstraction of its targets, i.e not only for users and applications, but also for functions and capabilities.